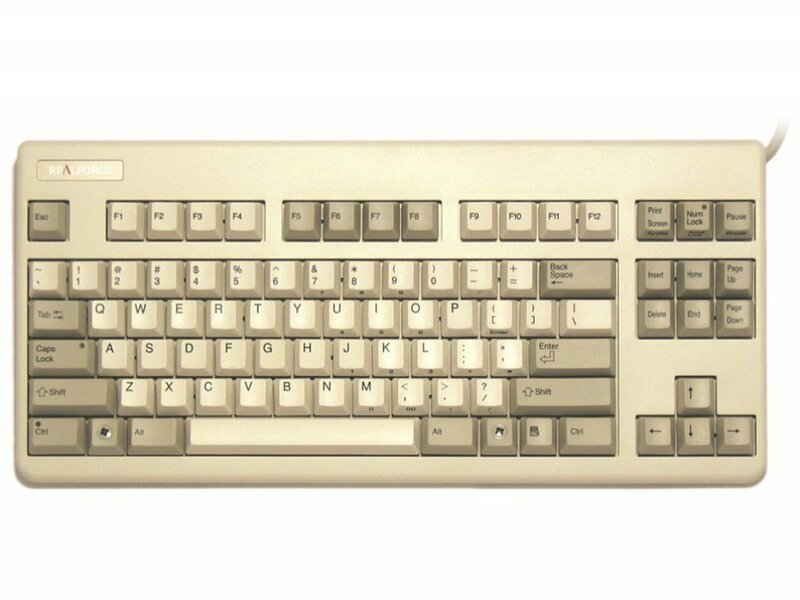 Now available the Topre Realforce 87UW keyboard, beige/grey with black legends, CapsLock and NumLock lights on the keys, and an embedded numeric keypad. It incorporates Topre's patented 30 million key life cycle non-contact electrostatic capacitance switches. The switch weight has been adjusted across the width of keyboard depending on their relative positions and usage (55gm, 45gm & 30gm +-15gm), to minimize fatigue for users, even after extended use, and are highly durable. The classic black on beige/grey keycaps with their soft tactile feel and N Key Rollover ensure fast and accurate input. Included are additional Ctrl and CapsLock keys and a keypuller. I agree with 23/01/2017-Anonymous; The keyboard is well built, has much nicer keycaps than my filco and the switches are more soft and silent than the mx blues I was using before. I liked and still like the blues but it took me only one day to forget (I also had functional issues with the blues; they wore out fast and sometimes didn't register keypresses). All in all quite expensive but probably worth it. Much more soft than the cherry switches the Topre is also much more silent. I only used it for a few days, but i already love it !